Travellers have relied on accurate timekeeping for navigation since the development of the marine chronometer in the eighteenth century. Galileo, Europe’s twenty-first century navigation system, also relies on clocks – but they are millions of times more accurate than those earlier timepieces. The operational Galileo satellites will carry two types of clocks – passive hydrogen masers and rubidium atomic frequency standards. Each satellite will be equipped with two hydrogen masers, one of which will be the primary reference for generating the navigation signals, with the other as a cold (non-operating) spare. Every operational satellite will also carry two rubidium clocks, one of which will be a hot (permanently running) backup for the operational hydrogen maser, instantly taking over should the maser fail and allowing signal generation to continue uninterrupted. The second rubidium clock will act as a cold spare. GIOVE-A, the Galileo in-orbit verification satellite that is currently in service, carries two rubidium clocks – one operational and one cold spare. GIOVE-B, which is projected to enter service later this year, will carry one hydrogen maser and two rubidium clocks, one hot and one cold spare. The GIOVE-A2 satellite, which will be ready for launch in the second half of 2008, will carry a similar timekeeping payload to GIOVE-A, but will transmit additional navigation signals. The Galileo passive hydrogen masers will keep time with an accuracy of around one nanosecond (one one-thousand-millionth of a second) in 24 hours – equivalent to losing or gaining a second in 2.7 million years. The rubidium clocks are accurate to 10 nanoseconds per day. In comparison, an ordinary digital wristwatch has an accuracy of about one second per day. Galileo’s passive hydrogen maser clocks will be around one thousand million times more accurate than a digital wristwatch. Conceptually, Galileo users will determine their position by measuring how much time radio waves transmitted by satellites in the Galileo constellation take to reach them. Radio waves travel at about 300 million metres per second, so they cover a distance of around 0.3 metres in one nanosecond. 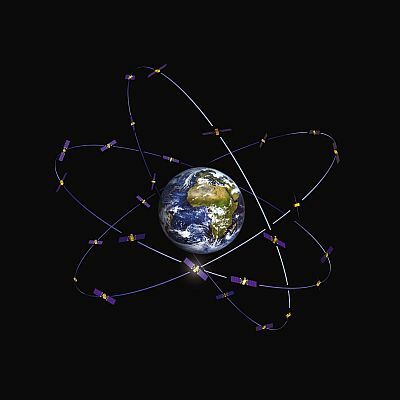 In order to offer navigation accuracies of the order of a metre, Galileo time measurements must therefore be performed with a precision in the nanosecond range. As a by-product of satellite navigation’s need for accurate timekeeping, Galileo will also be able to offer precision time services to be used, for example, in the time stamping of financial transactions.